The First Annual Monogram Designer Summit is Tomorrow! We’re so excited … on Wednesday, February 24, we will kick off the first annual Monogram Designer Summit here in Louisville, Kentucky! We invited more than 50 top designers from across the United States to join the GE Appliances product and industrial designers for a fun and interactive day of collaboration that will help shape the future of the kitchen appliance industry. Curious? Follow #MonogramModern on Instagram and Twitter to learn more about the speakers, break-out sessions, panel discussions, and participants. Today’s profile highlights Debra Gelety with Lori Carroll & Associates in Tucson, Arizona. Debra: Since the time I could hold a pencil, I have been drawing. My first degree was a BFA in Illustration and I worked as an Illustrator/Graphic Designer for many years. In 2004, I had some major life changes and found myself with the opportunity to try something new. I went back to school and got a BA in Interior Design. I joined the Lori Carroll & Associates team in early 2011, where I am an AutoCad drafting diva, associate designer, and presentation assistant. Debra: Although stainless steel finishes certainly have their place, I find they are overused. Also, I am not fond of the resurgence of gold tones in plumbing fixtures. Debra: I tend to think of trends as the design fashions that will be “dated” looking in a few years so I don’t look to follow trends. I am pleased with the increased attention to Universal Design, and love that there are increasing numbers of suppliers of cleverly designed storage fittings. As people are becoming more interested in smaller homes, especially in urban areas, storage becomes challenging. I also find I am specifying quartz as a countertop finish more and more. There are so many new and interesting patterns. 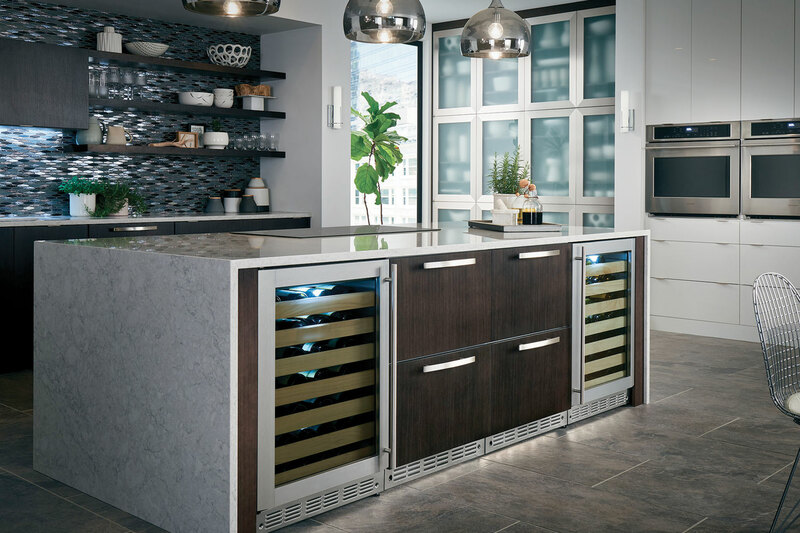 SRFD: Tell us about the Best Kitchen award that your firm recently won at KBIS 2016. Debra: The project was a new build contemporary home on a spectacular view lot in Arizona. The kitchen was located at the center of the home, open on one side to the breakfast area and the view, and partially closed to the formal entertaining areas. Pass-thru openings allow for the cooking member of the family to stay in contact with her guests. I think this kitchen is a great example of the implementation of NKBA design standards. We try to keep those standards in mind when space planning. The kitchen has great storage. The hidden pass-thru to the pantry where small frequently used appliances are stored out of sight, yet are instantly accessible, is my favorite feature. I also love that the design is very contemporary, yet warm. Kudos should go to the whole team, within LCA, as well as Jeff Willmeng Homes, Eglin + Bresler Architects, Rings of Wood Cabinetry, Tucson Stoneworks, and a great and enthusiastic client. SRFD: What did you learn at the Chicago Monogram Appliances Designer Training Session? Debra: Overall, it was a valuable experience. In design school we only receive basic information on appliances. Because I do a fair amount of space planning and often write the specifications documents our firm produces, I am aware of the technical specifications of the appliances we use, but I have never before actually used these models myself. I have a better feel for how one uses each appliance and why one might choose one type of cooking appliance over another. I now understand my mother’s love affair with her Advantium oven. You can learn more about Debra and the team from Lori Carroll & Associates on Facebook, Twitter, Pinterest and Instagram.